Heart rate monitors are ideal for giving your fitness regime a boost and lowering the risks involved in doing too much too soon. They provide real-time stats on the intensity of your workout and allow you to heart rate zone train. Fitness trackers and smartwatches are getting better at churning out statistics on your ticker, particularly when it comes to resting values and steady-state running. Its a slightly different story, though, when it comes to high intensity activities. Accuracy tends to suffer. For those very serious about running and training, a traditional chest strap is still the better option. But I, like many other people, am not a fan. They are cumbersome, a hassle to put on and not the most comfortable of devices. There is a wonderful feeling of freedom when you head out for a run without a wet chest strap wrapped around your chest. Luckily its 2018 and there are other middle-of-the-road solutions. Scosche’s heart rate monitors that work from your upper or lower arm are one such option. The company’s original RHYTHM+ made highly accurate heart rate tracking simpler than ever. When it launched a few years ago, it was one of a kind. Fast forward to today and this is not the case. Now there is direct competition in the form of Polar OH1 and Wahoo Tickr Fit. A few months ago Scosche came out with its second generation tracker. Called RHYTHM24, it sports an all-new look, expanded features and variable activity modes. I’ve been testing the new heart rate monitor over the past few weeks. These are my impressions. In the box, RHYTHM24 arrives with a machine-washable, soft elastic armband, an optical heart rate sensor made of a silicone and polycarbonate hybrid and a proprietary charger. There is also a little instruction booklet which doesn’t offer too much detail. That didn’t bother me too much. Whenever I have a new toy I tend to just switch it on and hope for the best! Who has time to read detailed guides anyway? The core unit measures around 50mm in diameter and is very lightweight. Inside, the device boasts Valencell’s latest PerformTek technology. This worked out pretty well for Scosche last time. Just like its predecessor, RHYTHM24 reads your heart rate with both green and yellow optical sensors. The company says this combination ensures greater accuracy across all skin tones. The main unit attaches easily to the ends of the one size fits all strap which can then be adjusted to fit your upper or lower arm. All you need to do is slip it on and you are set to go. Of course, the sensor needs to be on the underside of the armband in firm contact with the skin. I’ve tested the little gadget both on my upper and lower arm with no problems whatsoever. Once adjusted, the armband is comfortable and stays in place – a big improvement over wearing a chest strap. If you’re a stickler for discretion wear it on your upper arm and you can completely cover the tracker with your shirt sleeve. As with most optical systems, there may be a bit of trial and error on the part of the user as to where the best location is to get the best results. There are five training modes and a few multi-modes to choose from and a LED battery indicator with lights to indicate heart rate zones. On top of that, the device boasts a heart rate variability (HRV) mode that monitors the time between each heartbeat for stress and recovery tracking. 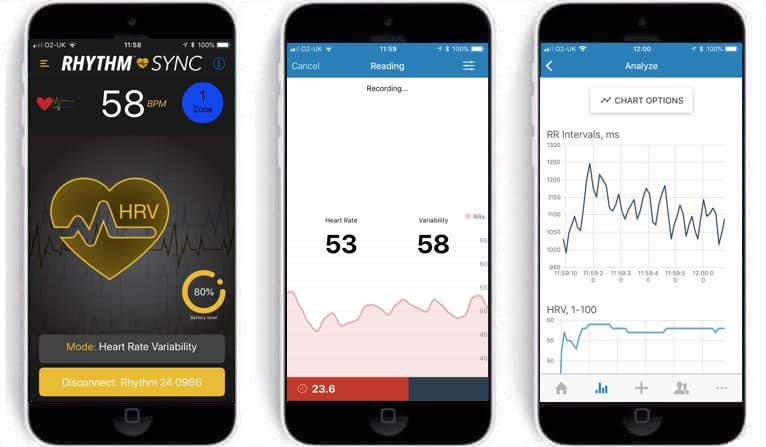 Still boasting both Bluetooth Smart and ANT+ for connecting with devices like smart/sport watches, smartphones, tablets and exercise equipment, RHYTHM24 brings a number of improvements over the original. Those that prefer training without a watch or a phone will be happy to know it now comes with internal memory. This is good for up to 13 hours of training time. Combined with the LED battery indicator, the on-board memory allows users to leave their mobile devices behind while they do their fitness activities and then upload their workout data later. The unit also contains something called NFC-A tag. This is not the same as NFC used for contactless payments. Rather its a way for the device to connect to equipment found in some of the larger gyms. As its name implies, the little gadget will now run a full day between charges, a significant boost to the 8 hours of its predecessor. Just pop the sensor into the charging cable and stick the charger into a computer port or USB power adapter. The lithium polymer battery will refuel in a couple of hours. There is a LED battery indicator on the device itself so you are not dependent on the app for monitoring battery status. To check just press the main button until the LEDs light up. 3 LEDs indicate 66-100%, 2 LEDs 33-66%, and 1 LED 1-33%. This is the same button used to switch the unit on and off. Another important upgrade over the original is waterproofing. The second generation device has an IP68 water-resistance rating and that is to a depth of 3 meters. More than enough for swimming. You will need to set the Rhythm24 to swim mode with the Rhythm Sync app prior to going into the water. The heart rate data will not be displayed in real time on your watch but you’ll be able to view it afterwards. Scosche says transmitting in water with ANT+ or Bluetooth does not work that well, so they recommend simply recording with RHYTHM24 while swimming. The unit will adhere to the ANT+ FIT file transfer standard so you can combine the data with your workout once out of the water. Now, at this point its worth pointing out that RHYTHM24 suffered from some early manufacturing issues. This resulted in cracks appearing on the underside of some units from an early batch. The company acted swiftly, found the cause and suspended manufacturing until this was resolved. It seems there was a relatively small number of defective units reported. I did not notice any cracking issues whatsoever on my unit, and I did look closely. Either I was one of the lucky ones or my unit is not from the initial batch. Whatever the case, it seems the problem has been resolved now. To the company’s credit, it offered and is still offering a no-hassle, no-questions asked replacement with known-good units to customers reporting the issue. The main thing to know is that this is a heart rate monitor and not a 24/7 fitness tracker, so don’t expect a step count, sleep analysis or anything of that nature. But do expect a device that will provide you with accurate heart rate and heart rate variability measurements. Scosche says RHYTHM24 is compatible with a ton of fitness apps. This includes RunKeeper, Map My Fitness, Strava and all other software devices that support Bluetooth Smart. It will also play nice with fitness gear that supports ANT+ technology. For testing purposes I used it in standalone mode, and also with my device of choice for running, the Garmin Forerunner 935. Unlike its predecessor, RHYTHM24 also comes with its own app, the Scosche Rhythm Sync. At the time of writing there is only on iOS version, but we are told the Android edition is in the works and should land in August. Register your details to log on, update the firmware and you’re set to go. A single press on the square button switches the unit on. The large LED light will turn purple and switch to blue once it picks up on the heart rate signal. This takes only a couple of seconds. There is another, smaller button to the left which is used to activate the recording mode. Unlike the first generation product, the buttons do need to be pressed firmly which is probably a good thing as it means you’re unlikely to trigger a function by accident. The LED lights on the tracker will show your heart rate zone. While this is good in theory, in practice you’re unlikely to pay much attention. If the band is on your upper arm, forget about it. But the feature is there for you to use it if you wish. The heart rate zones are configurable in the smartphone app by changing the Max Heart Rate and Resting Heart Rate. Other values will be calculated automatically based on those two and you’re other personal details. At the end of your session the data is transferred via Bluetooth to the smartphone app. Unfortunately the app is fairly basic, so there is hardly anything in terms of analysis of your stats and performance. You can export the statistics, though, as a .fit file, or share with Apple Health, Cycling Analytics, Strava, Todays Plan and Training Peaks. Apart from the standalone mode which worked well, I also used the RHYTHM24 in conjunction with my Garmin Forerunner 935. I found the two connected easily and quickly each time. The benefit of this combination is that I would simply sync my watch with the Garmin Connect app at the end of the session and all my heart rate data would transfer over. So no need to go through the Scosche Rhythm Sync app. Of course the most important question is to do with accuracy. On that count RHYTHM24 did not disappoint. I found that just like its predecessor, it was much better than a wrist based heart rate monitor and pretty close to what you would get if you were to wear a chest strap. I tested it on multiple runs against the Fitbit Versa, the internal Valencell sensor on the Forerunner 935 and most importantly against the Polar H10 chest strap. Below is a chart of my last run showing how it compares with the Polar H10 chest strap. As you can see, the two are virtually identical. And this was mirrored in other runs. The average values for the sessions were exactly the same every time, while the maximum heart rate value was at most off by 1 maybe 2 beats. I did notice that early firmware versions suffered from problems. If you were one of the first ones to use this product, you would have noticed incorrect calorie counts, missing training effect/load/recovery on Garmin devices, issues with running cadence. The good news is that most of these have been resolved with the latest firmware update which made its rounds about 10 days ago. The company is obviously listening to user feedback and is active in resolving any issues. Finally, an interesting spin on the whole heart rate tracking game is the RHYTHM24 HRV mode. HRV stands for Heart Rate Variability which looks at variation among the intervals between your heartbeats. Regular exercise strengthens the heart muscle, which means lower HR and higher HRV. You can connect RHYTHM24 to third party apps which can analyse this type of data. I connected it with no problems to the HRV+ app and Elite HRV. You can then use the data to asses the state of your health and fitness, recovery and readiness. Its clear that RHYTHM24 suffered from some early hardware and software issues. But many of these have been fixed now and Scosche is hard at work resolving others. Nothing that can’t be ironed out with a firmware update or two. I can’t help, though, but feel the company may have been better off waiting until all this was resolved before launching. Nevertheless, as a runner I can say the gizmo presents a significant improvement over the previous version that I loved. You still get the same accuracy of readings, but now with on-board memory, water resistance, 24 hours of battery life, multiple sport modes and a heart rate variability mode. Scosche’s middle of the road solution features a few options in term of where you can wear it, all of which are more convenient than a chest strap. Once adjusted, the armband is comfortable and stays in place. I did not find any connection issues at all, although its worth adding that I only used it with the Garmin Forerunner 935. On the flip side, the accompanying app is a rather simple affair and swim tracking could have been made simpler. While it’s not the most attractive of device around, RHYTHM24 is light, comfortable and accurate at measuring heart rate. If you are planning to ditch the old chest strap, Scosche’s latest arm band presents a great option. The added features are well worth the slight bump in price over the first generation product. If you’re wondering how the Scosche RHYTHM24 stacks up against Scosche Rhythm+ and its main competition the Polar OH1 and Wahoo Tickr FIT, click on this link. I have a Garmin FR 235. If I understand this correctly I would configure the Rhythm24 as a new sensor on my watch which and when I start an activity this is the HR that would be recorded in the workout and, when I am finished, uploaded to the Garmin Connect app. Am I missing anything? I am finding the Garmin to be erratic, especially during interval training, so hoping that the Rhythm24 works a lot better. That sounds correct. Just add any compatible heart rate monitor as a new device on your Garmin watch, switch on your heart rate monitor just before your workout, allow the watch to connect – and run. You’ll get a notification on the watch that it has connected to an external HR monitor. This is typically very quick – takes a few seconds at most.